версія 3.0.13 від 16 квітня 2019 р. After a series of hasty hotfixes we are happy to finally do a full-scale release. It may be not the biggest AdGuard browser extension release of all times, but it’s something. Inside you will find some small-ish changes and of course more bug fixes! This time, they were not so urgent, though. версія 3.0.11 від 2 квітня 2019 р. Sorry for another hotfix. It appeared, that filter lists updates were broken since v3.0 first release for those who restart their browser too often. This update fixes #1346and #1331.
версія 3.0.10 від 21 березня 2019 р. Turned out, we overlooked a couple of minor bugs and inconsistencies in the previous hotfix. Here's a quick fix to set things right. версія 3.0.8 від 7 березня 2019 р. As they say, you can't have a good release without a hotfix. Or maybe they don't say that, but we sure need one. In this update, we fix a particularly nasty bug that causes high CPU load because of some filtering rules. версія 3.0.7 від 6 березня 2019 р. New AdGuard Browser Extension follows the trends. As if ads were not bad enough, the web today is teeming with trackers. Big companies want to know everything about you, and AdGuard is here to stop it. 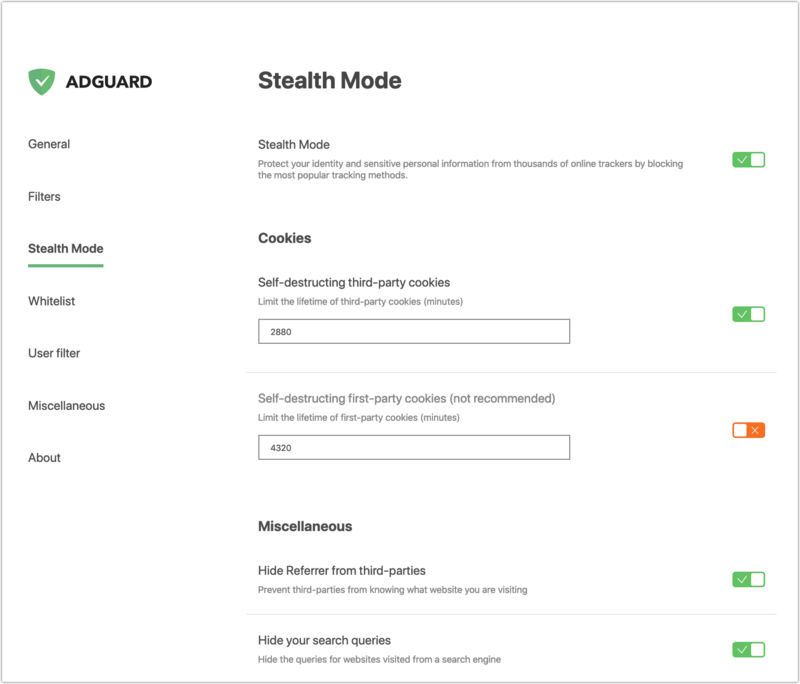 The new Stealth Mode is designed specifically to protect your online privacy — an entire new module dedicated just for that. But that’s even not the first thing you will notice. Of course, the new design will steal the show. Let’s have a closer look. Fresh icon and menu designs that make interface more natural and user-friendly, with a big ‘On/Off‘ switch. 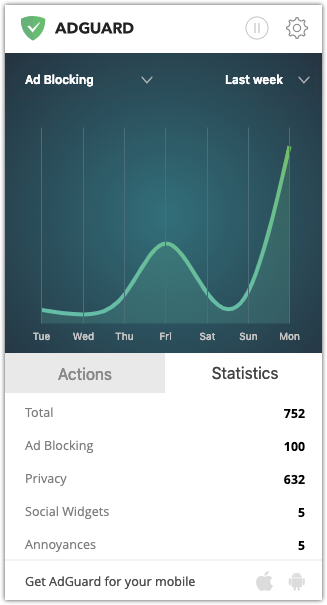 Brand-new ’Statistics" tab creates charts based on your blocked ads statistics, with the ability to show different types of data: total, filter-specific etc. Also worth mentioning is the User filter. It has undergone a few changes too. 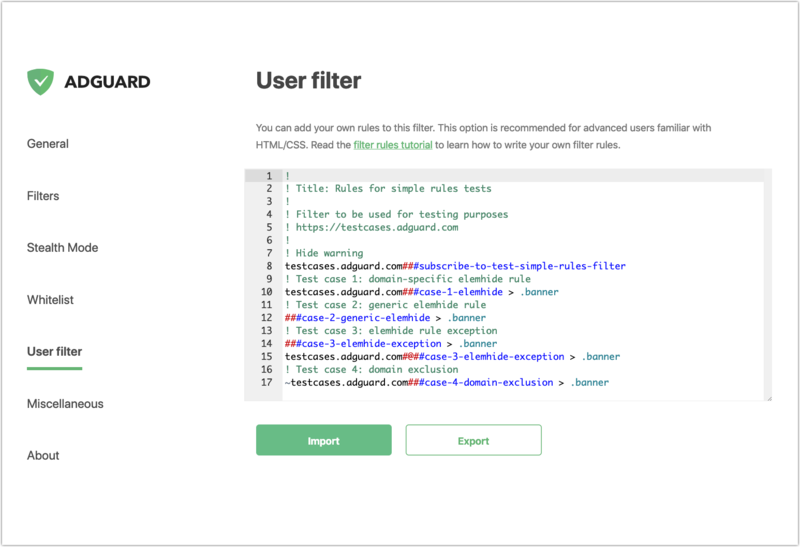 The new luminous element highlighting and auto-save function, as well as a unified text field for filtering rules should make editing more convenient. The text box can also be resized to your liking. We took online privacy protection in our extension to the next level by adding the Privacy module, which until this day existed only in the standalone AdGuard for Windows app. Although it doesn’t have the full capabilities of its desktop parent yet, it still makes the extension all the more effective for protecting privacy against trackers and analytical systems. It already gives you a wide range of privacy-related options (each explained in the tooltip), but we will surely add more in the future updates. We changed the way in which the filters are presented to users. Instead of listing them all together, we combined the filters into semantic groups. Each group includes filters that serve some particular goal. For example, filters that block ads are grouped together, filters that block trackers and serve privacy purposes will be united into a different group, etc. It is possible to enable and disable all filters in a group at once. Before, filters were automatically updated every 48 hours (default period), now you can adjust the frequency of automatic updates (by choosing from options: every 1/6/12/24/48 hours) or disable them completely, in case you prefer to update them manually. 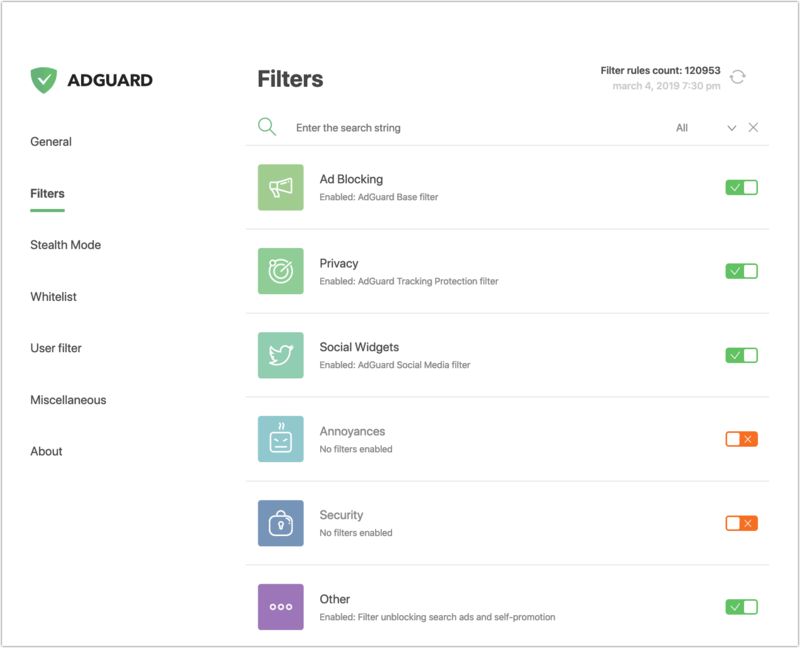 If you already have the AdGuard app, our browser extension may become a very useful additional tool, which can completely replace the browser-based ’AdGuard Assistant" module (learn more). It’s called Integration mode and now you can turn it on or off in the ‘Other settings’ tab. версія 2.10.11 від 2 жовтня 2018 р. Among important changes is a fix to the Assistant "block" button issue and a new "Save filtering log" feature that will come handy for filter developers and in some cases of troubleshooting via support. версія 2.10.8 від 28 серпня 2018 р. This update adds several minor-ish (although filter enthusiasts will argue) features to the Filtering Log and improves ad blocking quality. You'll find an array of bug fixes, as usual. Again, another treat for filtering rules creators. Previously you had to list domains old-fashioned way: example.com,example.eu etc, and now you can simply use example. * syntax. версія 2.9.2 від 11 квітня 2018 р.
Ho Ho Ho! Just kidding, it is not Christmas, but it might have very well been — isn’t every AdGuard Browser Extension release a special day for you? For us, it certainly is 🙂 This time we prepared a couple or two of quite important changes and improvements, to come along with a long list of more routine-ish fixes. Read on to find out the details. версія 2.8.4 від 2 лютого 2018 р. 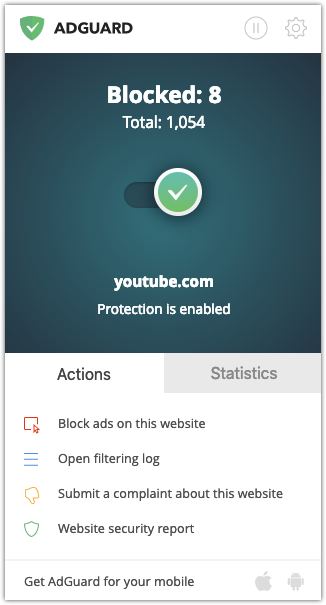 Ad blocking has been enhanced in this version by adding support for several modifiers. We've also integrated the extension with our web reporting tool, details below. As usual, all spotted bugs have been fixed too, this mostly concerns Firefox version. версія 2.6.5 від 22 серпня 2017 р. A long time has passed since the last release. But we weren't sitting on our hands. We fixed a whole lot of various bugs, so most users will find something positive in this update. This version also contains some sweet additions that will be interesting mostly for rule creators. This one is a rather obvious: when you use the manual blocking tool to create a rule, you can now give this rule a higher priority by ticking the checkbox. The `$important` modifier was available before, but you had to manually add it via the user filter. This is strictly for the rule creators, as it requires the basic understanding of the Content Security Policy security layer. This modifier completely changes the rule behaviour. If it is applied to a rule, it will not block the matching request. The response headers are going to be modified instead. You can find the syntax and examples for `csp` inside the issue. We had been waiting for this for a long time, it took a lot of time but now the code is much more simple and convenient to work with. The builds themselves are now available directly on GitHub, all the updates will be stored here. The build names are now more clear and understandable. There are few notable changes in this release that take place in Firefox version. First of all, FF have finally released the WebExtensions technology which allowed us to completely revamp the extension code. It now greatly resembles the code for Chrome extension, which makes it much easier for further development among other advantages. A lot of other improvements have been done, too.